verted to the Kona International Airport experiencing mechanical problems. Hospital leadership called a Code Triage and established an incident command center at 10:00am after being notified by Healthcare Association of Hawaii (HAH) of the potential for an aircraft mishap with casualties. KCH’s Triage Disaster Plan was activated. All essential hospital and security personnel immediately outlined their roles and began preparations for a large scale disaster. Emergency and surgical department staff notified off-duty nurses, physicians and surgeons to be on standby. Admitting department and business office personnel were placed on standby for emergency registration. 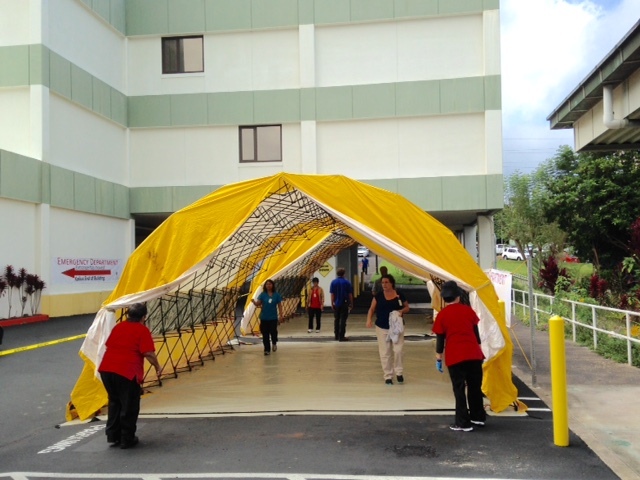 The hospital’s two triage tents were erected adjacent to the emergency department. 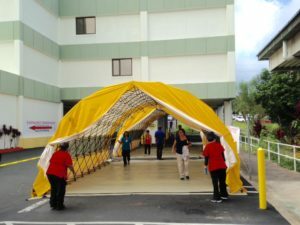 The yellow triage tents are used to manage an influx of patients or casualties. A decontamination tent was set up and provisioned in the KCH oncology clinic parking lot. Employees from human resources, infection control, medical oncology and housekeeping sprang into action to help maintenance and security employees set up the temporary emergency structures. Both triage tents and the decontamination tent were deployed within 25 minutes. At 10:40am department heads were called to the hospital command center. Facility director, Willis, announced that the United flight had landed safely at the airport, which led to sighs of relief and clapping.